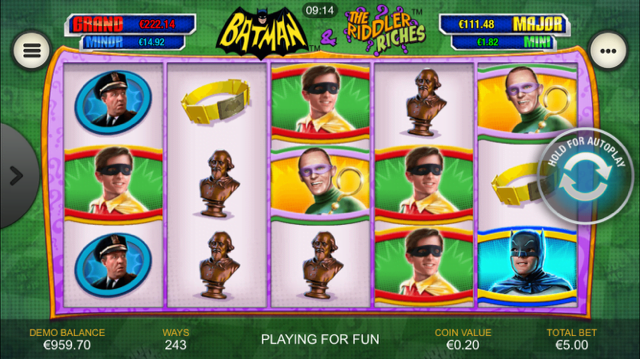 Batman & The Riddler Riches slot machine is part of the great new DC Comics series from Playtech. This slot, featuring the villain with the incomparable laugh, The Riddler, has 5-reels, 243 ways to win and a maximum jackpot of 2,500 coins per line bet. The game has an incredible three bonus rounds, one of which is a free spins bonus that gives the player 10 free spins and between 2 and 5x multiplier. You can check out the full Batman & The Riddler Riches slot review below. Riddle us this – what do you get when you cross the DC Super Heroes progressive jackpot prizes with collapsing reels and a trio of great bonus features? Why, the latest exciting instalment of Playtech’s Batman video slot franchise, of course, the fantastic Batman & The Riddler Riches slot machine. A five-reel title that includes the maximum 243 ways to win, the Batman & The Riddler Riches slot is one of the more ambitious titles to come out of the series so far and includes a plethora of in-reel incentives and bonus rounds to help your bankroll go further. Again using the standard array of Bat-symbols, this time the Riddler gets to play a starring role on the reels as players chase huge payouts. Playable from as little as £0.25 per spin, Batman & The Riddler Riches features collapsing reels throughout, meaning any winning payline combos disappear to be replaced with new icons. Any subsequent wins created can also be subject to a dynamic multiplier in one of the main bonus features – and there’s also the small matter of four progressive jackpot payouts being up for grabs. You’ll have to forgive us for getting a little breathless while describing the range of bonus features in the Batman & The Riddler Riches slot, because there are quite a few to explain. The collapsing reels we’ve already addressed above, but during randomly-chosen base game spins, the Riddler will also add mystery symbols to the reels that will transform into one regular icon to create combination wins. On top of that, mobile casino players will gain access to the Batman vs The Riddler Bonus wheel whenever the bonus symbol appears on reels one, two and three. From here, they can access one of three great features – Sticky Wild free games where any wilds that appear will remain in play for up to three consecutive wins, Multiplier Free Games where a prize multiplier will increase up to a maximum of 5x for collapsing reel wins and the Riddler Box Bonus, where they can uncover instant cash prizes. Finally – as with all of Playtech slots’ Batman slots – the randomly-activated DC Super Heroes jackpot round will give players access to one of four progressive prizes. The top award here is the Grand Jackpot which seeds at £1,000,000 and is activated whenever players reveal four red prize symbols. Undoubtedly one of the more engaging slots in the series, the Batman & The Riddler Riches slot serves up a flurry of fiendish features that ensure players’ bankrolls won’t suffer as they chase big jackpot prizes. Like the Batman & The Riddler Riches slot review? Check out these as well…..